M.I.S.S. make it simple, sister! 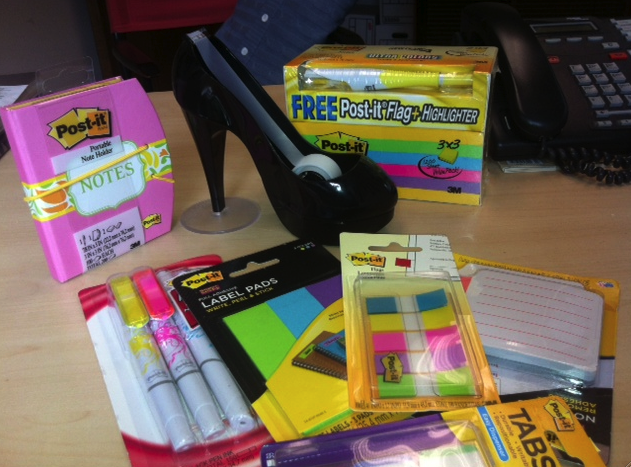 With all the back to school ads featuring shiny happy kids and college students heading back to school with fun gear … we’ve been thinking … Why not celebrate “Back to work!” or “Loving my Home Office.” Post-it, Scotch (the fabulous high heel tape dispenser) and stylish websites like seejanework.com are all ready to help you spruce up your space. Citrine crystals at your home and the office will help attract wealth and also improves your self-esteem. Other Feng Shui for office are the three-legged toad to earn extra incentives, the rooster to save yourself from the office politics, the three I-Ching coins in your wallet to attract money to it and the Chi Lin unicorn for promotions. Need an easy way to settle in to the weekend? 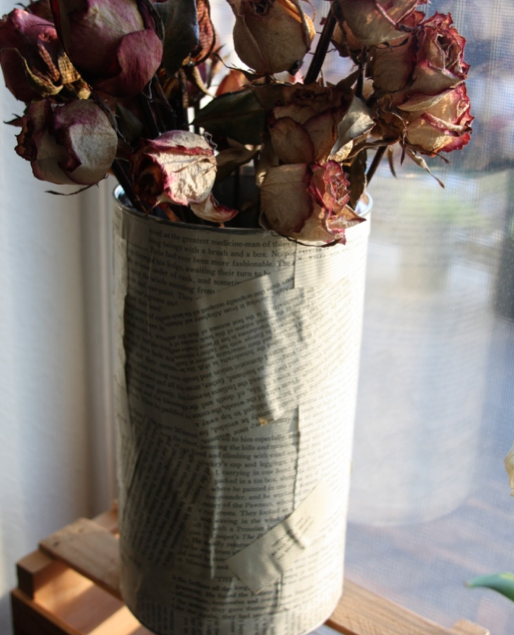 How about this quick DIY Flower Vase Project? You’ll need a mason jar, a garden with some flowers for cutting (or let’s be honest, your local grocery store) and some non-toxic spray paint — we like Krylon H20 Latex. 1. Make sure the mason jar is clean and dry. 2. Lightly sand the mason jar so that the surface isn’t slick. 3. Wipe clean with a cloth. 4. Spray paint the outside of the glass. It will take about 15-minutes before you can touch it and about 1 hour before it’s fully dry. 5. Add water and fresh cut flowers! Want more great DIY project ideas — check out one of our new fave blogs Design Sponge. How was the tax process for you? For us it was a reminder that we need to do a few more cool home projects, and save our hard-earned money! 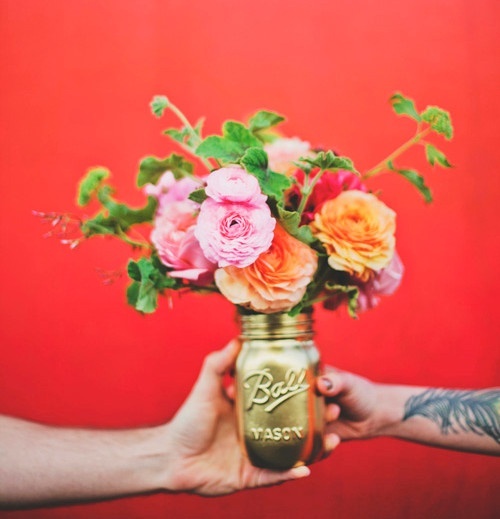 We loved this DIY vase or (pencil holder if you use a soup can) from Rebekah Birch’s blog, the Birch-way.com. She had a book project and was left with a grocery bag full of extra pages. Photo courtesy of Modish Blog. 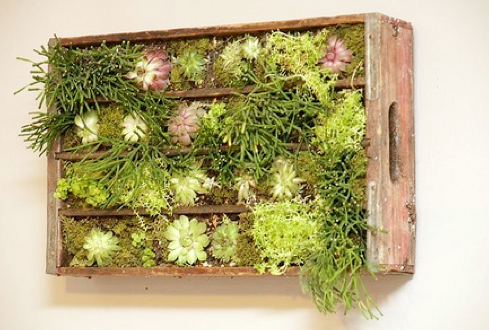 wooden soda crate, polyurethane coating (get this at a hardware store) about two dozen small succulents, succulent soil mix, green moss, chicken wire, some hardware to hang the thing, staple gun, scissors, wire cutters (for the chicken wire). About three days before your DIY project you’ll need to polyurethane coat the interior of the box. Add the picture hanging hardware to the back of the box. Put soil in each little box of the soda crate. Add the chicken wire over the soil and staple gun in place. Add your succulents (put the small roots through the holes of the wire into the soil). Fill in the bare spots with moss into the netting (this will hold the succulents in place until their roots are sturdy enough). Leave the crate off the wall for a few days so the plants have some time to settle in the holes. Then go ahead and hang!